Rep. Alexandria Ocasio-Cortez spoke about environmental issues at the January Women’s March in New York. Now the Green New Deal resolution shows that she means business. Nearly every week brings news of another scientific study about the devastating effects of climate change and the critical importance of doing something to counteract it. With their new majority in the House of Representatives, Democrats now have a way to bring the issue to the forefront, and they’re going big. Because they’re not going home. 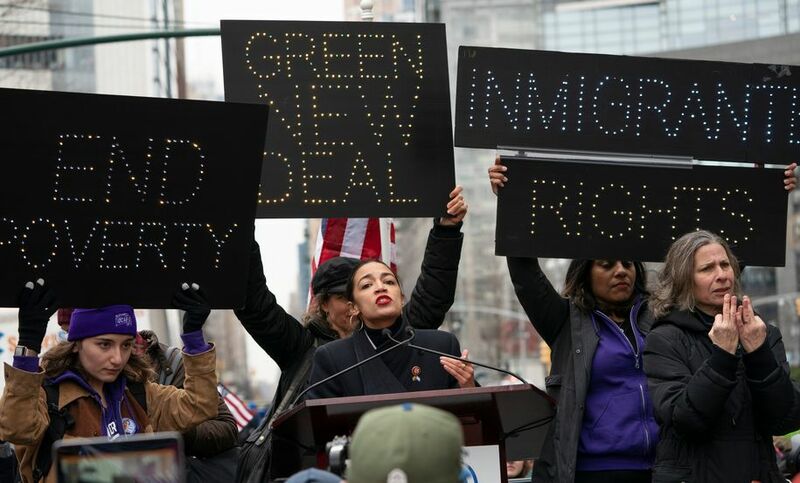 A joint resolution for a Green New Deal now has been released by New York Democratic Rep. Alexandria Ocasio-Cortez and Massachusetts Democratic Sen. Ed Markey. While it still doesn’t offer any actual legislative proposals, the resolution outlines more substantive details about the plan, which is a framework on how the country can move forward on climate action. Five goals in 10 years, including net-zero greenhouse gas emissions. National mobilization of the U.S. economy through 14 infrastructure and industrial projects, including upgrading and/or replacing every building in the U.S. for state-of-the-art energy efficiency. Social and economic justice through 15 requirements, including job guarantees and “massive” federal investments to groups and businesses participating in the project. Overall, this is about as strong an opening bid as anyone could have asked for. “[This is] the issue of our time, the challenge of our time, the opportunity of our time,” said Rep. Paul Tonko (D-NY), who chairs the Energy and Commerce subcommittee on the environment. Testimony followed from scientists and economic experts, who helped to lay out a “green transition” — an eventual decarbonization of the economy coupled with the creation of new jobs in sectors like renewable energy. At the same time, a second hearing on Capitol Hill, chaired by Rep. Raúl Grijalva (D-AZ), also took aim at climate change. “In 2018, there were 14 weather and climate disasters, each with damages over $1 billion, total cost $91 billion,” Grijalva said. The response from most Republicans was predictable. A few, such as Oregon Republican Rep. Greg Walden, described the need for bipartisan climate action. But Walden never bothered to hold a hearing devoted to climate chance when he was chair of the Energy and Commerce Committee. It’s hard to fathom how cutting greenhouse gas emissions would embolden ISIS. So instead of Gohmert’s imaginary threats, here are reports of actual new environmental threats, including the fact that 2018 was the fourth hottest year on record. But the fact that it was fourth warmest means only that it barely got beat by the three years that preceded it. Two new analyses from NASA and the National Oceanic and Atmospheric Administration gave the data about 2018. Of course there was no mention of climate change in Donald Trump’s State of the Union speech, only braggadocio about fossil fuel dominance (a claim that wasn’t even true). There was no mention of the increased number of extreme weather events exacerbated by climate change. Nor did he talk about the two new major reports (including one from his own government) warning that the world has 12 years to significantly reduce greenhouse gas emissions to limit global warming to 1.5 degrees Celsius above pre-industrial levels. Americans are just more interested in climate change, in general, than they used to be. Polls suggest that in the past two years, the American public started to believe more in climate change — and worry more about its impacts. Ultimately, it would probably take both public support and presidential support to reduce the threat of climate change. And, for the last 40 years, those two things haven’t lined up very well. Given that last year gave us 14 weather and climate disasters, according to NOAA, totaling around $91 billion in damages and killing at least 247 people, it’s way past time for presidential support. Since many of the 2020 Democratic presidential candidates have announced support of a Green New Deal, the time for action could be January 2021. The question is: How long will Republican senators hold out? Originally posted on Daily Kos on Feb. 10, 2019.